There’s a charm to short stories that novels may not always have. It expresses a tale in very few words, and to make sure no threads are left hanging is a challenge. I took this set of short stories as I felt that the collection would give me a welcome change from reading novels. 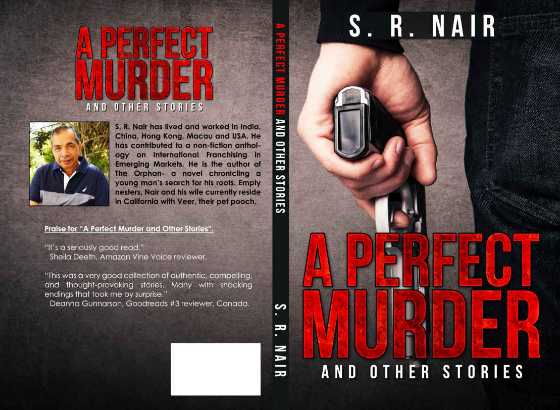 The title A Perfect Murder also appealed to the crime fiction lover in me. Perhaps it was the title, but I began reading with the assumption that it was a collection of short stories in the crime fiction genre (which is rare). The book has fourteen short stories, but they don’t stick to a particular genre. From the fourteen, there were few favorites, and there were stories that didn’t appeal to me as much. My favorite story from the collection was iPad. The story is perhaps the shortest one in the book, but it ranks right at the top because of the emotional ending. That the ending was also quite unexpected only added to the quality of the piece. Salma’s Fate is another story I liked. There might be a Salma we know or whose story we may have read in the news. But this story, thankfully, has a positive twist to it instead of a negative one. The story Visa for America felt familiar, like I had read it before somewhere. But it ended unlike how I thought it would. The love story still had a chance for a happy ending, and I was thankful for that. Other stories that I liked were The Soothsayer, The Grandson, and Seema. The stories not only cover a variety of genres, but also many themes that are quite common to see. There’s a mother-in-law who wants a grandson, and doesn’t accept the granddaughter though she had daughters of her own too. There’s a man who divorces his wife over the phone because she went against his father. There’s a lovelorn man who still wants to be with the old “crush” even though he’s married. These are characters that seem familiar or real. The author puts each story across quite well. I like stories that leave something to the imagination. But most of the stories here had an enormous amount of detail. Though that helped to bring the scene to life, it didn’t quite manage to engage me as a reader. The title story, I felt, was a bit too long (though a perfect murder would need planning, I suppose). There aren’t many twists either. You know what might happen, and more often than not, that happens. I’d read the collection to enjoy some simple, almost realistic stories. It’s a one-time read, but not a quick read. I took longer than I thought I would to finish it. I thank the author for sending me a copy to peruse and review. That's cool...It's always interesting to read stories which seem real. It's recently I found out that short stories are not of much appeal when it comes to publishing. This saddened me. Because I have read many wonderful short stories. I am really not sure whether it's the trend in Indian publishing scenario . I will try to get Mr. Nair's book.